This dinosaur is all set for Valentines Day! A great addition to your boy applique stash! Font shown on shirt is available as a separate purchase. Please see the Related products tab. 4x4: 3.74 x 3.88. SC: 6875. 5x7: 4.95 x 5.16. SC: 9397. 6x10: 5.91 x 6.16. SC: 11,395. 8x8 or Durkee Hoop: 7.25 x 6.92. SC: 13,925. This dinosaur is all set for Valentines Day! A great addition to your boy applique stash! Font shown on shirt is available as a separate purchase. Please see the Related products tab. 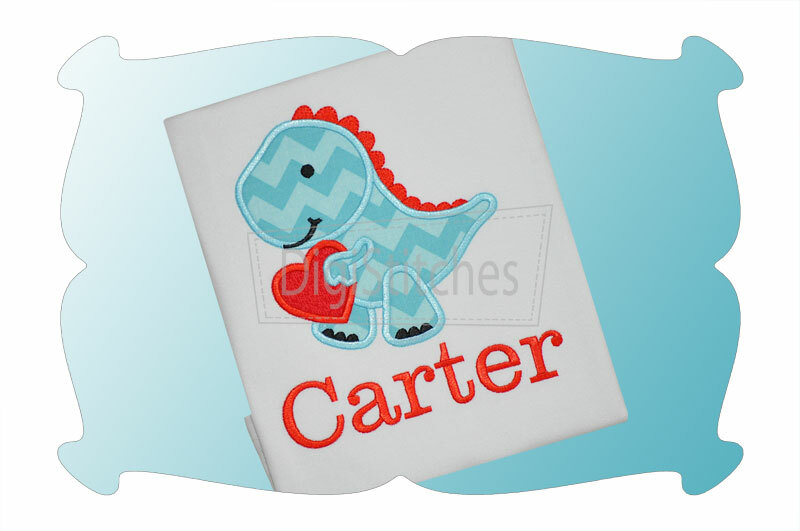 The Valentines Day Dinosaur applique comes in 4 sizes. All sizes included with your purchase!